Air Inter Flight ITF148, an Airbus A320, took off from Lyon (LYS) at 18:20 on a domestic service to Strasbourg-Entzheim Airport (SXB). Following an uneventful flight the crew prepared for a descent and approach to Strasbourg. At first the crew asked for an ILS approach to runway 26 followed by a visual circuit to land on runway 05. This was not possible because of departing traffic from runway 26. The Strasbourg controllers then gave flight 148 radar guidance to ANDLO at 11DME from the Strasbourg VORTAC. Altitude over ANDLO was 5000 feet. After ANDLO the VOR/DME approach profile calls for a 5.5% slope (3.3deg angle of descent) to the Strasbourg VORTAC. While trying to program the angle of descent, "-3.3", into the Flight Control Unit (FCU) the crew did not notice that it was in HDG/V/S (heading/vertical speed) mode. In vertical speed mode "-3.3" means a descent rate of 3300 feet/min. In TRK/FPA (track/flight path angle) mode this would have meant a (correct) -3.3deg descent angle. A -3.3deg descent angle corresponds with an 800 feet/min rate of descent. The Vosges mountains near Strasbourg were in clouds above 2000 feet, with tops of the layer reaching about 6400 feet when flight 148 started descending from ANDLO. At about 3nm from ANDLO the aircraft struck trees and impacted a 2710 feet high ridge at the 2620 feet level near Mt. Saint-Odile. Because the aircraft was not GPWS-equipped, the crew were not warned. 1 - The crew was late in modifying its approach strategy due to ambiguities in communication with air traffic control. They then let the controller guide them and relaxed their attention, particularly concerning their aircraft position awareness, and did not sufficiently anticipated preparing the aircraft configuration for landing. 2 - In this situation, and because the controller's radar guidance did not place the aircraft in a position which allowed the pilot flying to align it before ANDLO, the crew was faced with a sudden workload peak in making necessary lateral corrections, preparing the aircraft configuration and initiating the descent. 3 - The key event in the accident sequence was the start of aircraft descent at the distance required by the procedure but at an abnormally high vertical speed (3300 feet/min) instead of approx. 800 feet/min, and the crew failure to correct this abnormally high rate of descent. 4.1 - The rather probably assumptions of confusions in vertical modes (due either to the crew forgetting to change the trajectory reference or to incorrect execution of the change action) or of incorrect selection of the required value (for example, numerical value stipulated during briefing selected unintentionally) . 4.2 - The highly unlikely possibility of a FCU failure (failure of the mode selection button or corruption of the target value the pilot selected on the FCU ahead of its use by the auto-pilot computer). 5 - Regardless of which of these possibilities short-listed by the commission is considered, the accident was made possible by the crew's lack of noticing that the resulting vertical trajectory was incorrect, this being indicated, in particular, by a vertical speed approximately four times higher than the correct value, an abnormal nose-down attitude and an increase in speed along the trajectory . 6.1 - Below-average crew performance characterised by a significant lack of cross-checks and checks on the outputs of actions delegated to automated systems. This lack is particularly obvious by the failure to make a number of the announcements required by the operating manual and a lack of the height/range check called for as part of a VOR DME approach. 6.7 - The absence of a GPWS and an appropriate doctrine for its use, which deprived the crew of a last chance of being warned of the gravity of the situation. 7 - Moreover, notwithstanding the possibility of a FCU failure, the commission considers that the ergonomic design of the auto-pilot vertical modes controls could have contributed to the creation of the accident situation . It believes the design tends to increase the probability of certain errors in use, particularly during a heavy workload. As a result of this accident Airbus made some design improvements to the FCU giving the digital VS mode read-out 4 digits and the FPA read-out just 2. 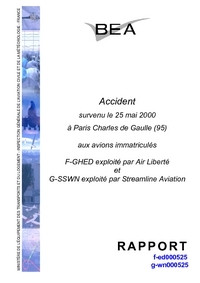 Furthermore, 34 safety recommendations were issued by the French BEA. Distance from Lyon Satolas Airport to Strasbourg-Entzheim Airport as the crow flies is 364 km (228 miles).